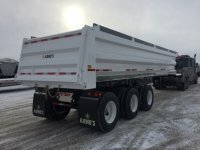 End Dump trailers are a mainstay of your construction site. They're versatile, built for tough loads and a large variety of materials. 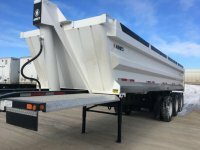 Maxim carries new end dump trailers from Arne's and East, as well as used end dumps in a variety of makes. 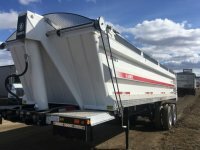 You can browse our end dump trailer inventory below, or contact a Maxim account manager in your area to learn about options for building an end dump trailer that meets your unique specifications. 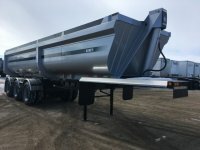 Available in Tandem and Triaxle models. Main frame constructed using 100,000 psi tensile flange material. Flared I beam cross member flanges and stiffener ribs formed into the webs are key to our strong frame. Formed 8" channels are used between the suspension hangers for even greater frame rigidity. Box width of 8.5' designed with wide hat channels & formed "Z's" to support the floor full length, minimizing floor sag. Sturdy full width floor cross members help eliminate box flex in the hoisted position. Floor is made of 3/16" abrasion resistant material with rounded corners that extend 9" up the sides to provide maximum durability without excess weight. Our dropped frame with the hinge pin location results in a lower center of gravity for improved stability when dumping. Box sides are built with 10 gauge steel on the lower half and 12 gauge steel with a full length horizontal rib on the upper half. Our one piece upper and lower side sheets eliminate the need for vertical seams. Superior box design with a pre-cambered top rail to reduce side bowing. 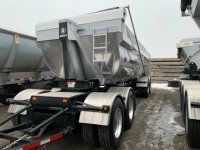 All Arne's trailers are finished with ENDURA paint products and carry a 5 year warranty. 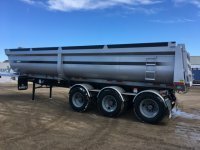 Arne's Conventional End Dumps carry a 5 year warranty on the Main Frame Rails and a 3 year warranty on the Box. 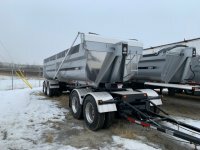 East End Dumps are designed to maximize payload, and deliver strength and durability to meet the needs of all types of dump trailer applications. Genesis Smooth-sided aluminum help you sav e up to a half-mile per gallon compared to ribbed trailers. Aerodynamic design is easier to clean, and will not show any pings and dings on the outside. Outboard Geneiss design provides more capacity than external post-style trailers. 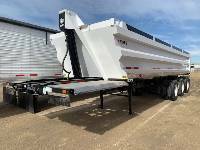 Light-weight and longer-lasting components give the East trailers a high resale value. 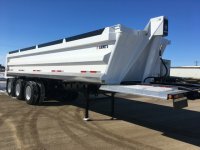 All East end dump trailers come with a 5-year aluminum warranty and 1-year steel warranty.